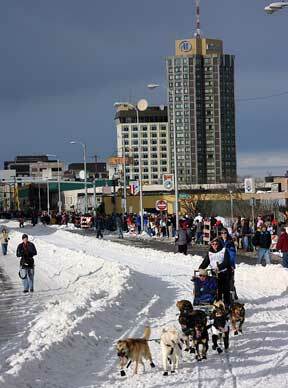 A crowd collects along Fourth Avenue as the ceremonial start of the 2002 Iditarod gets underway. (The other photos on this page are from the 2005 race.) 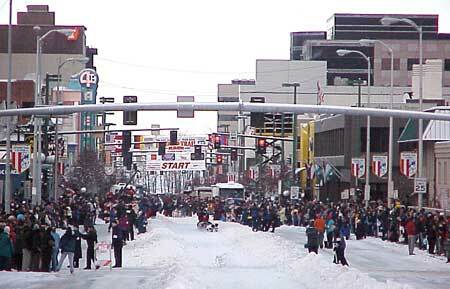 The downtown start is an all-morning event as the teams leave the starting line about three minutes apart. 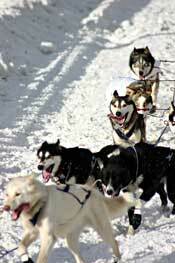 A musher takes his team around the first turn in the Saturday start in Anchorage. Snow bermsand roped off sidewalks separate the teams from spectators as they go from Fourth Avenue onto Cordova Street. 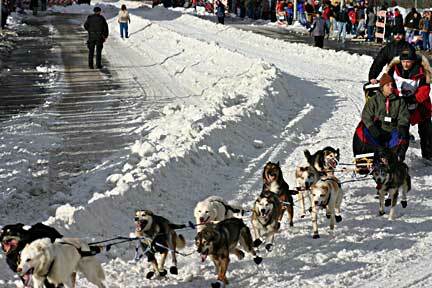 This early in the race, the musher has an assistant riding behind him and a paying passenger on the sled. He and his dogs will take to the trail alone in the Sunday restart of the race. Another musher takes the turn. The highest building visible in the background is a hotel.